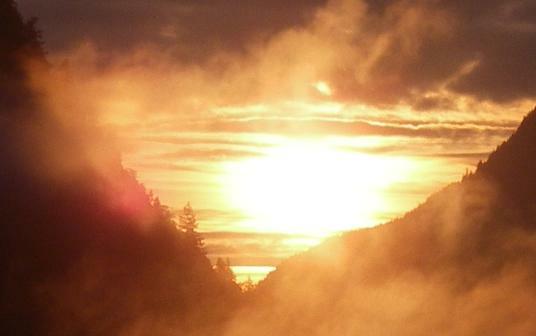 The grizzly bear river tours start in the estuary of the Glendale River. There are many different channels that could be used at low tide but only one or two that will get you up the river as the tide rises. In this case we are in the channel we need to use but the bears are in another but as the tide rises and the channels merge we move much closer. Again patience is the key when viewing wildlife. 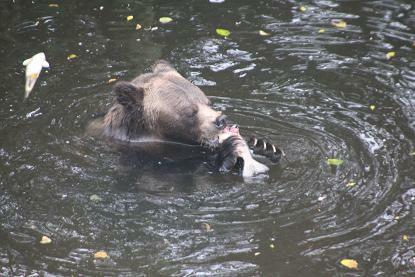 This sub-adult grizzly bear was coming down river as we were moving up with the tide. It was not a bear we normally saw in the area but familiar enough with the boats that it did not run into the forest. As you can see it had been in the water but moved to the shore as we approached. The shore being about 20 meters (yards) away, which shows again that it was not afraid. 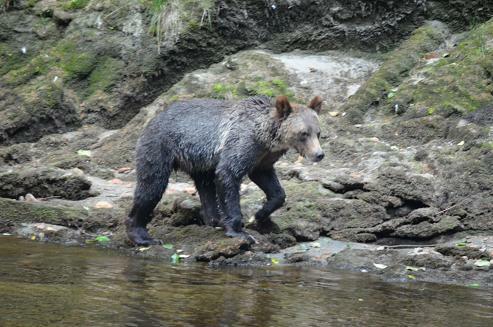 We bears we see on our tours have accepted our presence, which is another way of saying if we do not see them they must be strangers and they stay off the river. Some days are complete even before you leave the dock. 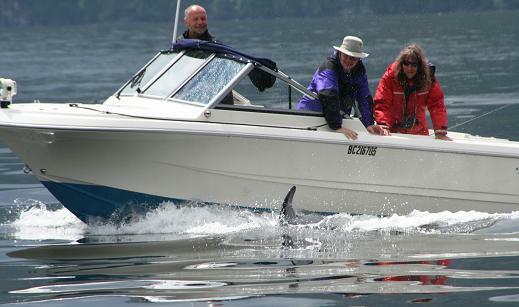 Once you are with a large pod of pacific whitesided dolphins they are everywhere. They seem to like 8 mph (GPS speed) as a speed for running along side the boat. Glenn took this photo of my guests not believing what they were seeing. Note the glare from my head. 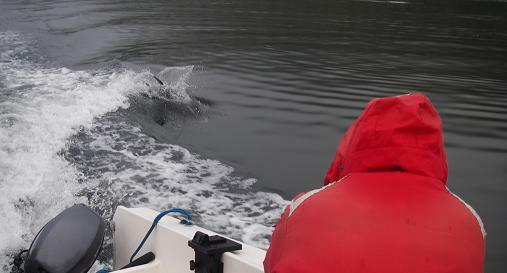 Besides running beside the boat they follow in the wake and stick their nose within one meter (yard) of the motor’s prop. The key to operating the boat is to maintain a constant speed and direction or the dolphins will leave. Not a territorial fight rather siblings play-fighting. In the spring and early summer there are eight or ten bears we see on most days and there may be the same number further up the river. 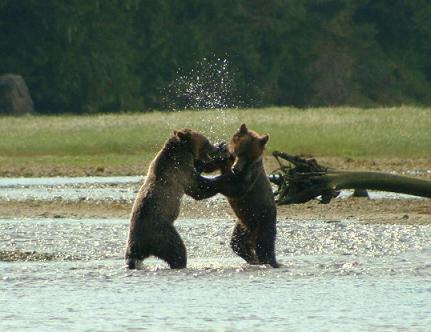 In the fall once the salmon arrive the number of bears in the area has been estimated as high as fifty. The interesting fact about the bears in the Glendale River valley is that there is so much food that it does not pay to fight because an injury at that time of the year means you may not survive hibernation. When there is an abundance of salmon grizzly bears become selective. Male salmon because they do not contain high fat roe (eggs) are second choice. We watched this bear pass several males until it selected a female. Also this was late September and the grizzlies had been feeding on salmon for a month and a half, which also makes them more selective as they bulk up for hibernation. These two orca / killer whales passed under our boat and surfaced a few meters (yards) away. Explanation: looking at the photo their appears to be a dorsal fin at the top of the photo but it cannot be from the main orca because that would mean it was coming out of it’s belly. The belly of an orca is white and it is possible to see the tip of the tail at the end of the photo. So it could be one orca diving over the back of another or the dorsal fin could be the tail of another orca and the second one is following too close. Either way it was close. On grizzly bears tours from the lodge in the spring we watch the grizzlies along the shore scrapping mussels and barnacles from logs and turning over rocks for high in protein food made up of crab, clams, amphipods and other tiny invertebrates. This cub less than six months old is already turning over rocks to supplement mothers milk, which has 4.5 times more fat and 17 times more protein than human milk. 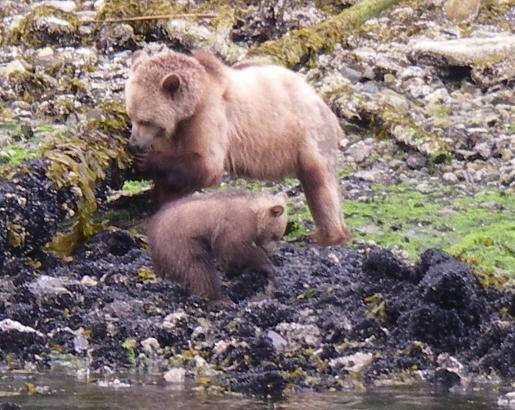 The first and second year grizzly bear cubs we observe on our tours in the area of Knight Inlet are learning the necessary life skills from their mother. 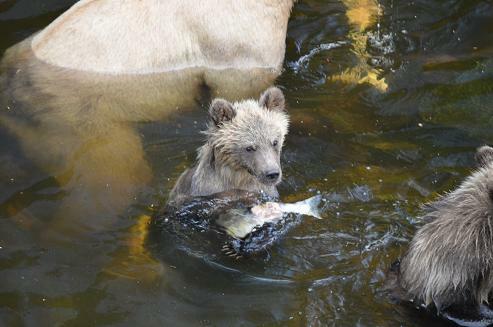 In this case it sat in the water held the salmon in one paw and started to eat. Rolling rocks is tomorrow’s post. Tim O’Neil does it again, an excellent photo of A72. 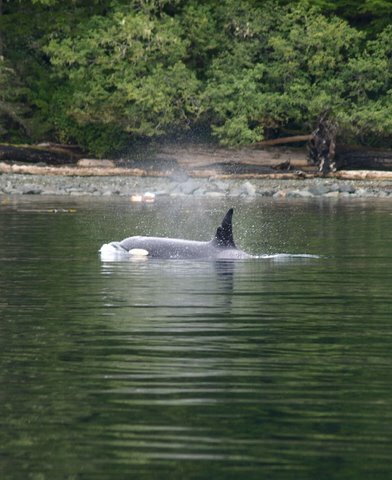 Resident and transient orca along the coast of British Columbia have photo identification catalogues that make use their unique dorsal fin and saddle patch to identified each orca. Some ID’s are easy and this is one of the easy ones. The notch in the front of this female’s fin identifies her, as A72 she was born in 1999 daughter of A50 born is 1964. A50 is daughter of the pod’s matriarch A30 born in 1947. The Orcas live in a matriarchal community. The females live much longer than the males, and therefor have more valuable experiences, which make them the dominant. 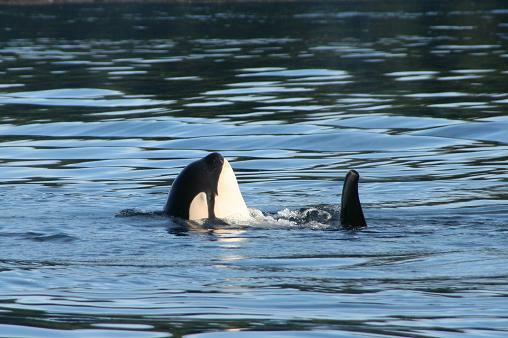 The males stay with their mother all their life and breed outside their pod. 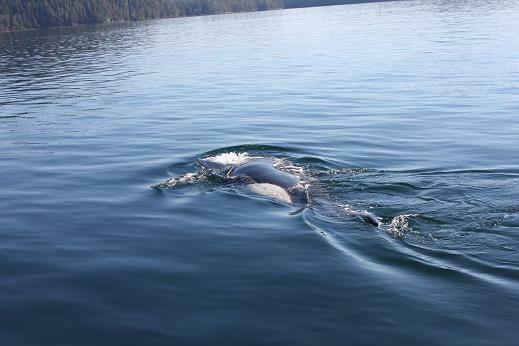 The pods are named after the dominant female in this case A30 and they are members of the northern resident orcas which spend the summer in the waters north of Campbell River close to Telegraph Cove in the Johnstone Strait.